Gus Bodnar will always be remembered for his impeccable timing. In his very first NHL game, October 30, 1943, Gus stepped onto the ice for the opening faceoff for the Toronto Maple Leafs and promptly set a record by scoring a goal 15 seconds into that first shift. The Leafs went on to beat the New Rangers 5-2 that night. It was the first of 22 goals Gus would score during the 1943-44 season, and along with 40 assists, gave the rookie a berth within the NHL's top ten scoring leaders. Bodnar was selected as the Calder Trophy winner as the NHL's rookie of the year, edging Bill Durnan of the Canadiens, who simply led the Montreal Canadiens to a first-place finish and the Stanley Cup. 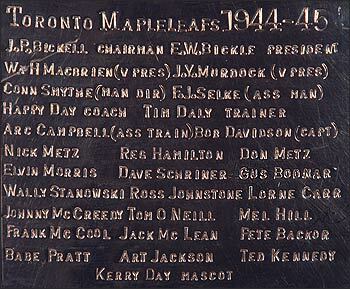 Bodnar was part of the first Maple Leafs' dynasty, helping the team win championships in 1945 and 1947. Then, shock of shocks, Gus and linemates Gaye Stewart and Bud Poile, all natives of Fort William (now Thunder Bay, Ontario) along with Bob Goldham and Ernie Dickens, were shipped to the Chicago Blackhawks on November 2, 1947, with Max Bentley leaving the Hawks for Toronto. But remarkable timing reared its head again on March 23, 1952 while Gus was in Chicago. On the final night of that 1951-52 regular season, Gus was playing on a line with George Gee and Bill Mosienko when Mosienko established a record by scoring three goals in an astonishing 21 seconds. Gus assisted on all three goals to set a record of his own for the three fastest assists. Bodnar finished his NHL career in Boston, then was recruited to coach the Toronto Marlboros of the Ontario Hockey League. In 1967, while the parent Toronto Maple Leafs won the Stanley Cup, Gus led the juniors to the Memorial Cup championship. In 1972, while coaching the Oshawa Generals of the OHL, Bodnar was voted recipient of the Matt Leyden Trophy as the junior loop's coach of the year. In 1983, Gus Bodnar was elected to the Northwestern Ontario Sports Hall of Fame for his contributions to the game. In 1995, he was voted into the Oshawa Sports Hall of Fame for the same reason. On Saturday, June 25, the Stanley Cup met up with Gus Bodnar at the Oshawa Lakeridge Health Centre. Health had robbed Gus of most of his energy, but he was clearly excited to be visited by the embodiment of hockey excellence, the Stanley Cup. 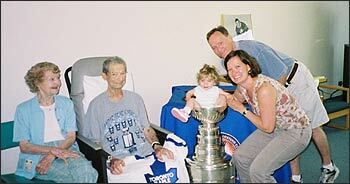 When the Cup arrived at 10 o'clock that morning, it was greeted by 82-year-old Gus, wearing a Toronto Maple Leafs t-shirt. Etta, his bride of 57 years, looked resplendent in blue, too, and had made certain that her husband's miniature Calder Cup, a photo of Gus in his Maple Leafs' heyday and banners from the 1945 and 1947 seasons were displayed in the room. Their daughter Cheryl, her husband Brian and their boys Ryan and Eric, visited on this special day, as did daughter Carolyn, her husband Peter and their wee baby Lara. It was a family reunion of sorts, marred only by the fact that daughters Bonnie and Andrea were in the Caribbean and unable to join the celebration. 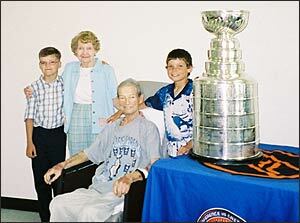 Gus's nine-year-old grandson Eric brought his hockey team in to see Grandpa's Stanley Cup. 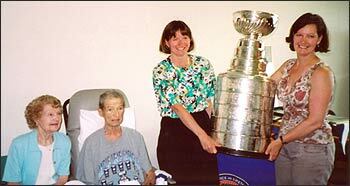 They helped take the Cup from room to room so other residents could enjoy hockey's prestigious trophy. When granddaughter Lara was placed in the bowl of Lord Stanley's Cup, Gus lit up the room with as broad a grin as was seen that day. Although Gus's energy had flagged of late, he was genuinely excited to see the Stanley Cup, and its presence lifted his spirits considerably. He was shown his name engraved twice on the Stanley Cup. There, in 1945 and again in 1947. 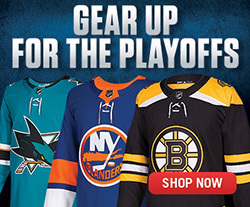 When the Stanley Cup was redesigned from its stovepipe look to the shape we now know so well, his name was engraved 'August Bodnar,' his birth name, but when the bands were standardized and re-done, they used 'Gus,' which is what the Leaf forward read on this day. Smiling and cheerful, Gus indicated that he would like to drink out of the Cup. As a Stanley Cup champion, he had earned that privilege, so the bowl of the Cup was filled with water and the Cup was lifted and tilted towards him by his sons-in-law. Using a straw, Gus was able to sip from the Stanley Cup, and was tickled to, at last, be able to indulge in that celebratory practice. Several friends visited Gus on his day with the Cup. Longtime friend Ted Maki, who played on the Canadian World Championship teams in 1962 and 1963, dropped by. So did Wayne Daniels, now a scout for the Pittsburgh Penguins, but who spent better than twenty years with the Oshawa Generals, moving up the ladder from trainer to scout and later, to general manager. It was an amazing day for Gus Bodnar, and an outstanding tribute to a terrific athlete and a true competitor. Then, on Friday, July 1, just six days after his visit with the Stanley Cup, Gus succumbed to the cancer that had ravaged his body. His competitive spirit kept him fighting for life to his final breaths but, surrounded by family and having lived a full, long life, Gus Bodnar died. The Stanley Cup had arrived just in time to give Bodnar a boost, rekindling memories of a life well spent and reminding Gus and those he loved most what a terrific champion he had truly been. Friday, return to Stanley Cup Journal to visit Hank Goldup and Al Dewsbury as the Stanley Cup Champion Alumni tour continues through the summer. 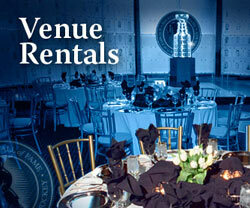 Kevin Shea is the Hockey Hall of Fame's Manager of Publishing and Editorial Services.